MIAMI–The Coast Guard Cutter Resolute crew repatriated 50 Haitian migrants Tuesday to the Haitian Coast Guard. 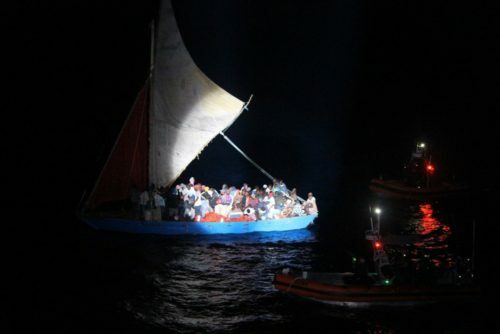 The repatriation is a result of an interdiction conducted by both the U.S. Coast Guard and Cuban Border Guard, in which the vessel was intercepted with 127 Haitian migrants. The crew of the Coast Guard Cutter Reliance located an overloaded 70-foot sail freighter Saturday approximately 20 miles off the northeast coast of Cuba. The Reliance crew launched their Over-the-Horizon small boat to assist the migrant vessel taking on water. The smallboat crew transferred 50 Haitian migrants to the cutter. The other 77 migrants refused lifejackets and the vessel entered Cuban Territorial Seas. The Cuban Border Guard took custody of the remaining 77 migrants for further disposition. “This case is one of many inherently dangerous voyages interdicted this year in the unforgiving waters of the Caribbean Sea and Florida Straits,” said Lt. Cmdr. Jeremy Montes, 7th District duty enforcement officer. “These ventures are ill advised because they place the people aboard in grave risk of injury or death due to the unsafe loading of the vessel and lack of adequate lifesaving equipment. The Coast Guard and our partner agencies continually monitor the maritime border of the U.S. to deter, detect and rescue migrants who embark on illegal and life threatening voyages.” Once aboard Coast Guard cutters, all migrants receive food, water, shelter and medical attention. Approximately 1,334 Haitian migrants have attempted to illegally migrate to the U.S. through the maritime environment since Oct. 1 compared to 1,869 Haitian migrants in fiscal year 2017. These numbers represent the total number of at-sea interdictions, landings and disruptions in the Florida Straits, the Caribbean and Atlantic. The cutter Reliance is a 210-foot medium endurance cutter homeported in Kittery, Maine. The cutter Resolute is a 210-foot medium endurance cutter homeported in St. Petersburg, Florida.